If there were a hall of fame for smart, tough and ethical judges, U.S. District Judge James Redden would be in it for his stewardship of federal salmon-recovery efforts over the past decade. It came as no surprise last week when the 82-year-old said he is retiring before 2014, but his shoes will be hard to fill. One of Redden's strengths is his analytical process that has held federal agencies to compliance with the law. Whoever replaces him will have a solid foundation of decisions on which to base future rulings. This provides some degree of optimism that the state will continue in the right direction on hydro-system and habitat management. 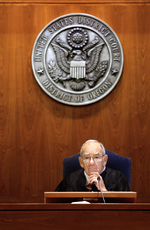 Judge Redden Leaves Powerful Legacy <-- Full article available at original site.